A GoFundMe page has been launched to help pay funeral expenses for Daniel Romero, who was killed in a collision while riding in Cudahy last weekend. It’s raised over $2,100 of the $10,000 goal in less than 20 hours. And hopefully can reach the rest of the way, as his family struggles to cope with his loss. Maybe someone who lives or rides in Cudahy can give us some insight on what needs to be done to improve safety in the city, so this doesn’t happen again. Because one death is one too many. This is why you don’t pass a school bus when its lights are flashing. Even on a bicycle. Bicyclist offers a lesson in bike path etiquette, which mostly concerns not using the Ballona Creek bike path as your personal race track. KPCC’s Air Talk discusses municipal regulation of e-scooters and dockless bikeshare in the wake of Beverly Hills ban on both. Santa Clarita is painting “Heads Up!” on local bike paths in an effort to get bike riders to pay more attention to their surroundings. Which doesn’t exactly seem like the biggest threat riders face. Calbike wants you to tell the state DMV that self-driving cars aren’t ready for the road. Then again, many of the ones with drivers don’t seem to be, either. La Mesa is working to improve bicycle and pedestrian access to the industrial part of the city. Not to mention the wineries and breweries that have opened there. Santa Barbara gets $15 million from the state to build a 2.6-mile bike and pedestrian path, while Santa Maria gets $300,000 for a similar project; both would be defunded if the state gas tax increase is repealed in the fall election. Atherton busts bike riders for rolling through stop signs, issuing eight $238 tickets along with two warnings. Sad news from Crockett, where a 42-year old bike rider was killed when he was rear-ended by a truck driver, who fled the scene. A website for gay and bi women lists the top 25 cinematic dykes on bikes — their words — with no distinction between women on bicycles or motorcycles. Or spin classes, for that matter. In an apparent effort to force everyone back into their cars, the next round of Trump’s China tariffs will target ebikes. Which could kill their growth just as it’s taking off. A Washington writer says there’s no such thing as being too old or too out of shape to ride a bike. A road raging New Mexico driver faces up to five years behind bars after being charged with intentionally backing into a group of bicyclists, seriously injuring one of the riders. He denies any responsibility, claiming the victims just ran into his car when he stopped after they flipped him off for no apparent reason. A Minnesota paper talks with Melody L. Hoffmann, author of Bike Lanes Are White Lanes: Bicycle Advocacy and Urban Planning, about the invisible cyclists and the need for equity in advocacy. Apparently, Detroit isn’t exactly the safest place to ride a bike after all. Not satisfied with getting off with a slap on the wrist for killing a woman on a cross-country bike ride, an Ohio woman is asking the court to seal the record of her conviction so she can “heal from this accident.” And apparently not suffer any repercussions, unlike the victim and her family. Like bike riders virtually everywhere, residents in Atlanta are questioning the lack of bike funding in the city budget. A North Carolina bike rider was collateral damage in a police chase, losing his leg when the driver of a stolen car slammed into him after fleeing police at speeds up to 100 mph. Warning: This story includes a deeply disturbing bodycam video of the police tending to the victim, who is in extreme pain and in fear for his life. The newspaper showed a severe lack of judgement in posting it. Evidently it’s not just Los Angeles. Officials in South Carolina rip out a road diet and bike lanes after complaints from angry drivers. Which leaves the situation just as bad as it was before, if not worse. A Tampa bike rider says bicyclists don’t ride on the sidewalk because they want to, but because it’s safer. However, studies have repeatedly shown just the opposite, demonstrating that bicyclists are safer on the street than on sidewalks, where multiple driveways and limited sight angles dramatically increase the risk. A Vancouver video shows bike riders aren’t the only ones who roll stop signs. A Montreal cemetery that has been open to the public for the past 166 years is now banning bike riders. Though I’m sure it would welcome any run down on the roads after losing a safe place to ride. Despite the overwhelming success of London’s cycling superhighways, the network remains patchy after five boroughs and other authorities blocked plans for new lanes. London’s Mirror shares eight secrets to help build your child’s confidence bicycling on the road. An American man is calling for safety signage after his wife was killed when she crashed her bike into a trailer full of sheep after rounding a sharp turn on an Irish trail; two other American tourists were killed on the same trail recently. Europe’s high-powered ebikes continue to take a toll, with over 100 ebike riders killed in the Netherlands since 2014. A New York bike advocate says Millennials are the key to brokering peace between bicyclists and drivers on the streets of Perth, Australia. Fifteen Taiwanese children from disadvantaged families are riding around the island nation to provide support and comfort to elderly people in nursing homes. Thanks to Megan Lynch for the heads-up. The South Bay’s Easy Reader News recounts last weekend’s 57th annual Manhattan Beach Grand Prix. This is what it looks like when you finish the last 30 miles of a Tour de France stage with a broken kneecap after tumbling over a retaining wall. Peter Sagan vowed to continue in the Tour after the world champ misjudged a corner and crashed into the forest on Wednesday; fortunately, nothing was broken. Costa Rican pro cyclist Andrey Amador wants to make history for his country in the Tour. A book excerpt recounts the shotgun shooting of America’s only remaining Tour de France winner, before Greg LeMond came back and won the tour two more times. The New York Times says American flags are disappearing from the Tour, along with American cyclists. The Undefeated website recounts the day seven years ago when Guadeloupe native Yohann Gene became the first black cyclist to compete in the Tour de France. A writer for the Telegraph learns what it’s like to sort-of ride a grand tour. That feeling when a new protected bike lane leaves the street too narrow for cars to get through. Note to world: It’s not an annual event until there’s a second one. And you know you’re having a bad day in the Tour de France when police mistake you for a fan and try to kick you off the course. Just one day after Frederick Frazier was killed in a brutal hit-and-run in South LA, another rider was struck in the same intersection. During a protest over Frazier’s death. And yes, that driver fled the scene, too. A group of Frazier’s friends gathered to block the intersection at Manchester and Normandie with their bicycles to call attention to the death and demand justice for their fallen friend. The protest got out of hand after several people attacked an LAPD SUV when police arrived to break it up, smashing its windows with their bikes. According to Streetsblog’s Sahra Sulaiman, the young men were angered after graphic photos of the man they knew as Woon were posted online overnight, showing their friend splayed out on the street as another rider attempted to comfort him in his final moments. A woman in a tan car, who had previously gotten out to argue with one of the protesters, forced her way through the intersection, running a red light in the process, and deliberately slammed into a rider identified as Quatrell Stallings, throwing him into the air. She then gunned her engine and fled the scene as Stallings stumbled to the curbed. He was taken to a local hospital; reports are he was not seriously injured. Now police are looking for two hit-and-run drivers. One with a $50,000 bounty on his or her head for leaving Frazier to die in the street; another who could — and should — be facing a charge of assault with a deadly weapon. A memorial ride will be held for Frazier this Friday. Thanks to Evan Burbridge for the heads-up. A Desert Hot Springs man has received a well-deserved murder charge in the death of Washington man participating in this year’s Tour de Palm Springs. Twenty-one-year old Ronnie Ramon Huerta Jr. is accused of driving up to 100 mph while stoned before slamming into 49-year old Mark Kristofferson, killing him almost instantly. He was taken into custody after the arraignment hearing, and held on a $1 million bond. He’s also charged with driving on a suspended license and driving under the influence of drugs. Thanks to Victor Bale for the link. The LAPD’s Van Nuys Division misses the mark with a bike safety awareness flier. The piece tells bicyclists to “Always ride in single file,” even though there’s nothing in state law that prohibits riding two or more abreast. And riding abreast is often safer in lanes that are too narrow to share with a motor vehicle by increasing visibility and preventing unsafe passes. The piece also says riders should walk their bikes across busy intersections, which increases the risk by decreasing mobility and exposing riders to careless and distracted drivers for a longer period of time. And never mind that a bike helmet may be a good idea, but it’s not required for anyone 18 or older. But if the point is to increase awareness of bike safety, where is the companion piece telling drivers to always watch for bikes, pass with at least a three foot distance, and open doors with your right hand to prevent dooring? Metro released their draft strategic plan for the next ten years, as they transition from a transit provider to focusing on the entire mobility ecosystem. CiclaValley explains what it’s like getting cut off in the bike lane by a Metro bus driver in DTLA. A writer in Azusa encounters a 43-year old gang member at his local bike shop, realizing that bikes bring everyone together. A pair of UC Santa Barbara graduates are nearing the completion of their self-supported bike tour from California to Columbia. The bizarre anti-bike hysteria continues in San Luis Obispo, where the city council is accused of dirty tricks after re-affirming plans for a bike boulevard. Meanwhile, older SLO residents are up in arms over plans for an e-bikeshare system with a hub on the coast, worrying about whether they’ll be run off the sidewalk. The San Francisco Chronicle shares the five best bike rides around Santa Cruz. Testimony in a preliminary hearing fills in some of the blanks in the death of a San Francisco woman run down in Golden Gate Park last year, one of two people killed in the city by hit-and-run drivers just hours apart. Another good piece from Bike Snob’s Eben Weiss, who considers the ethics of breaking traffic laws, noting that obeying the letter of the law isn’t always the safest way to ride. Wired says Uber’s acquisition of dockless ebike provider Jump means they want to control every way you move, while Bicycling examines dockless bikeshare in the wake of Uber’s entry into the field. Curbed says cities need to step up to the challenge of controlling streets and sidewalks as bikeshare and shared scooters begin to take over. Don’t count on glowing infrastructure lighting the streets anytime soon. A local news site says Honolulu drivers are complaining about the loss of a few hundred parking spaces to make room for bike lanes, somehow blaming that for the traffic congestion in the city. No bias here. Police in Portland OR ignored a road rage assault on a bike rider that left him with a broken jaw, refusing to even file a report on the case. A local weekly says Portland’s bike renaissance begins now. A Lincoln, Nebraska man gets three years behind bars for the drunken hit-and-run that left a city councilmember from a nearby town lying badly injured in the street. The Catholic bishop of Davenport, Iowa is one of us; he’ll be riding across the state in this year’s RAGBRAI. Three Illinois priests are riding across their Diocese to promote religious vocations. Seriously? A road raging North Carolina man gets a gentle caress on the wrist for punching a bicyclist in an attack caught on video, as he’s sentenced to just three days behind bars. That will certainly send a message — one that says go ahead and attack other people on the roads. A British man has been charged in the death of a 91-year old cyclist, who was killed while trying to set a national age record. A transportation technology project from the University of Melbourne says to improve safety and performance on our streets, we’ll all have to be connected in a single network including cars, buses, pedestrians and bicyclists. An Aussie ultracyclist set a new record by riding 555 miles in 24 hours. The head of cycling’s governing body says women cyclists deserve more than they’ve been getting, and he dreams of a Paris-Roubaix Feminine. An autopsy concludes that Michael Goolaerts suffered a heart attack while riding in Paris-Roubaix last Sunday; there had been speculation that his heart stopped as a result of the fall. Writing for Cycling Tips, Jonathan Vaughters reminds us that bike racing is a dangerous sport, where tragedy can happen any day. Hit a pothole on your bike, and get a bill for breaking it. Your next wheel could weigh ten pounds and make riding easier. And no, dockless bikes don’t belong in trees. Last week, we mentioned a study from the Governors Highway Safety Association indicating that bicycling fatalities had spiked 12.2% in 2015. Now the Governors group has released their full report on bicycle safety. The new study, A Right to the Road: Understanding & Addressing Bicyclist Safety, offers an in-depth examination of both the causes and possible solutions to the problems facing bike riders in the US. And for the most part, seems to get it right. Starting with a title that establishes our unquestioned right to the road right off the bat. Admittedly, I haven’t gotten very far into the Governors study yet, making it only through only about a third of the report’s 75 pages. But unlike some of their previous efforts, the GHSA attempts to put the facts — or at least, more of the facts — in context, noting that the jump in fatalities could be due in part to an increase in ridership. Why hasn’t the percentage of bicyclists killed on U.S. roadways decreased? The simplest explanation may be the lack of protection afforded to bicyclists and the difference in mass when they collide with a motor vehicle. This results in asymmetric risk – bicyclists are likely to sustain a serious injury; the vehicle occupants are not (Ragland as cited in Williams, 2014). Also, noteworthy is the impact weather can have on bicycling. A mild winter, for example, can change bicycling patterns, resulting in increased exposure risk from motor vehicle crashes. Another factor is the economy – more traffic fatalities tend to occur with low unemployment and low gas prices (NHTSA, 2016). Changes in exposure may also be due to the increase in popularity of bicycling because of its health and environmental benefits. 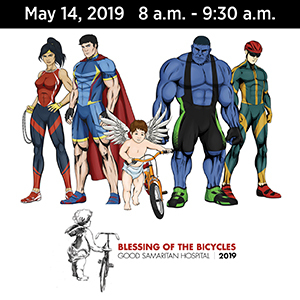 It is estimated that 34 percent of Americans (103.7 million) three years of age and older rode a bicycle in the past year (Breakaway Research Group, 2015). While most rode for recreational purposes, bicycle commuting is also increasing, although the U.S. continues to lag behind other countries in the percentage of people who commute by bike (McKenzie as cited in Williams, 2014). 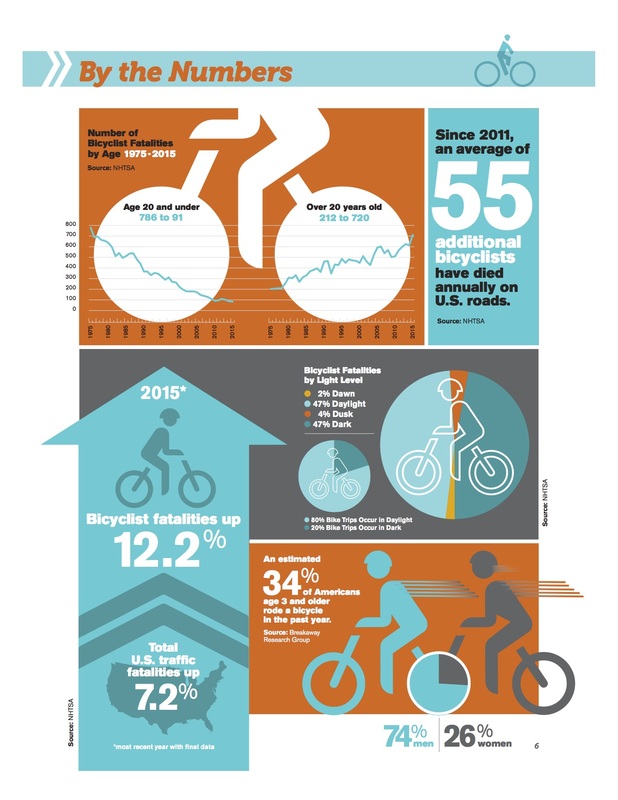 Even so, according to the latest U.S. bicycling and walking benchmarking report, the percentage of adults biking to work has increased from 0.4% in 2005 to in 0.6% in 2013. The increase is more significant in large cities, which saw commuting by bicycle increase from 0.7% to 1.2% during this same time period (Alliance for Biking & Walking [ABW], 2016). Bike share programs are also helping to spur the growth in U.S. cycling, as the number of systems has increased from four in 2010 to 55 in 2016, with users logging 88 million trips over the past six years. In 2016 alone, bike share riders took over 28 million trips; that is equivalent to Amtrak’s annual ridership and tops visits in a single year to Walt Disney World (National Association of City Transportation Officials [NACTO], 2016a). Despite this unprecedented growth, it is important to note that there have been only two deaths associated with bike share programs. Although I once again have to object to their lack of nuance regarding helmet use, which fails to take into account the limitations of bike helmets, or whether collisions that resulted in head injuries could have been survivable with one. The value of wearing a bicycle helmet cannot be overstated, since in a majority of bicyclist deaths the most serious injuries are head- related (Sacks et al., as cited in IIHS, 2016). Helmets are estimated to reduce the risk of head injury by 50 percent, and head, face or neck injury by slightly more than 33 percent (Sacks et. al, as cited in IIHS, 2016). However, a 2012 national survey of adults found that slightly more than half reported never wearing a helmet (Schroeder & Wilbur, 2013). It’s also surprisingly progressive in places, like this section on where to ride. Where a bicyclist may ride has been debated by roadway users and elected officials for decades. Where to ride laws generally tell bicyclists where they should position themselves on the road, which in most states is typically as far to the right as practicable. 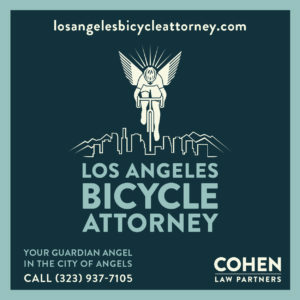 The challenge comes with defining practicable, which likely means different things to a cyclist, a motorist and a law enforcement official. The LAB notes that “what is practicable is often context sensitive based upon road and traffic conditions” and therefore “recommends that cyclists ride in the right third of the lane with traffic” (2017). Safety should be the primary focus when it comes to where a bicyclist rides in the roadway. 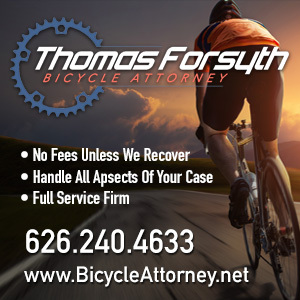 To that end, Colorado’s law states that a bicyclist should ride “far enough to the right as judged safe by the bicyclist to facilitate the movement of…overtaking vehicles” (LAB, 2017). The language strikes a balance between a cyclist’s safety and the efficient movement of traffic. 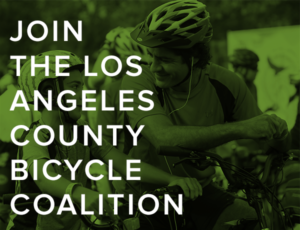 That progressiveness continues into their their recommended action steps for state officials, ranging from educating policy makers about Complete Streets to developing ebike policies and legalizing speed and red light cameras. We could all benefit if most, if not all, of the Governors recommendations are carried out. Whether you choose to travel by two feet, two wheels or four. Let’s just hope the people responsible for making those decisions read it, too. *Just to be clear, I always wear a helmet when I ride. But they should always be considered the last line of defense when all else fails. Once again, the rain in Spain failed to remain on the plain, as riders slogged through the 11th stage of the Vuelta; Cycling Weekly offers video highlights of the race. How to change your shoe mid-race. KCRW’s Design and Architecture program discusses the over-the-top rage over the lane reductions in Playa del Rey, while saying they only saw three bicyclists using the bike lanes over a one hour period. However, it would have been nice if someone had pointed out that the lanes were removed to slow traffic, not make room for bike lanes; it shouldn’t be up to us to make LADOT’s arguments for them. Bike SGV will be providing a free bike valet at UCLA’s season opener at the Rose Bowl this weekend. The recently closed Coates Cyclery in Pomona is officially no more, as its landmark sign was replaced with one for the pet hotel that’s taken its place. Thanks to Erik Griswold for the heads-up. Santa Clarita deputies ticketed 45 drivers in Wednesday’s bike and pedestrian safety enforcement operation; no bicyclists or pedestrians received tickets. After a decade of discussion, Long Beach is moving forward with planes for a 9.5 mile bicycle boulevard connecting North Long Beach with downtown and the shore. Caltrans hired Jeanie Ward Waller, the former Calbike policy director, to head its new Sustainability Program. Which seems like a contradiction in terms for the department responsible for California’s unsustainable highway system. A new bike and pedestrian safety project designed to improve safety for San Clemente students promises to make things a lot worse before they get better. San Diego opened a one-mile protected bike lane connecting the Mission Valley and Mid-City neighborhoods. Police in San Diego are looking for a bank robber who fled the scene by bicycle. A Thousand Oaks resident says wait just a minute to plans for a bike lane through Potrero Valley, insisting it’s too high a cost for something that will only be used by recreational cyclists. Which is a common argument against bike lanes, based on nothing more than the writer’s own groundless prejudices. Sad news from San Luis Obispo, where a 22-year old student at Cal Poly was killed in a hit-and-run while riding near his home; a 17-year old girl was arrested later, admitting to police she’d been drinking before the crash. The hit-and-run driver accused of killing the top lawyer for UC Berkeley as he paused on a bike ride has a reputation for public drunkenness, though too much time had passed before his arrest to test him following the crash. Slate says security bollards are the best defense against using motor vehicles as weapons, while helping to make cities more livable; an Op-Ed in the New York Times says expanded, smartly designed pedestrian areas will help reduce the danger, as well. Both could help improve safety on Hollywood Blvd and the area around the Chinese Theater and the Hollywood & Highland shopping plaza, which remain dangerously vulnerable to an automotive terrorist attack. Good question. Streetsblog asks why automakers are allowed to sell cars that can go faster than 100 mph, exceeding the speed limit anywhere in the US. Judging by their ads, car makers go far beyond enabling speeding to actually encouraging dangerously aggressive driving. A Bicycle Times Op-Ed says don’t be part of the problem by breaking the law on your bike, because everyone is watching. And judging. A HuffPo writer heads to her local bike shop to ride a bicycle for the first time in 55 years. Portland residents hang banners and signs urging drivers to slow down after a woman was killed riding her bike. Meanwhile, Portland’s bikeshare system now offers $3 a month memberships for anyone with a food stamp card. A Bloomberg editorial in an Idaho paper says speed cameras save lives, and we need them everywhere. Nowhere more than California, where speed limits are mere suggestions, and speed cameras are currently illegal. Montana residents will get their wish and get their parking back, after the Missoula city council votes to remove bike lanes that people continued to park in anyway. Denver Streetsblog says glowing balloons aren’t the answer to keeping people safe on the city’s streets. A teenaged Rhode Island bike rider escaped serious injury when he was collateral damage in a road rage dispute between two drivers who chased each other around a Burger King parking lot. The company behind New York’s Citi Bike bikeshare is developing a dockless bikeshare bike that would also be compatible with existing docks. New York City is installing free bike pumps in a trio of popular riding locations. Philadelphia’s bikeshare bikes will sport fine art from Van Gogh and other artists. Cycling Tips offers advice on how to keep riding once you have kids. A British boy gets his bike back after it was stolen while he helped rescue a two-year old who had fallen into a pond, albeit much worse for wear. Irish bike riders have been fined 1,660 times since on-the-spot fees for bicycling violations took effect two years ago; bike advocates just wish drivers would receive the same treatment. French bike couriers say not so fast to plans from the country’s new president to relax labor laws. A road raging Aussie bike rider has turned himself in for punching a bus driver after confronting him at a nearby bus depot. Note to Daily Mail: Of course he was still in his riding gear; was he supposed to strip naked first? Nothing like a bikeshare idea whose time has come 40 years later. Don’t believe everything your GPS tells you. And you know you’ve got a problem when the people being paid to build a bikeway aren’t allowed ride their bikes, on or off it.